Rains lashed several parts of the country triggering landslides in some hill states, which killed at least four Indo-Tibetan Border Police personnel in Arunachal Pradesh and affected the Amarnath pilgrimage in Jammu and Kashmir, as monsoon covered the entire length and breadth of India two weeks ahead of its schedule. Evening showers in the national capital caused the humidity level to shoot up to 90 per cent even as the mercury settled at a notch below normal. The monsoon winds blew away the dust from Delhi air and the city breathed the cleanest air in nearly a year, authorities said. The Air Quality Index (AQI) value for the capital was a 'satisfactory' 83 on Friday. It touched this level on Wednesday after the heavy pre-monsoon showers, according the Central Pollution Control Board data. An Air Quality Index between 0-50 is considered 'Good', 51-100 'Satisfactory', 101-200 'Moderate', 201-300 'Poor', 301-400 'Very Poor', and 401-500 'Severe'. The last time Delhiites breathed such clean air was in August last year, an official with the Central Pollution Control Board said. Meanwhile, the monsoon has covered the entire country, 17 days ahead of its normal schedule. It reached Sriganganagar, its last outpost in the country located in west Rajasthan. Its normal date to reach Sriganganagar is July 15. "The monsoon today covered the entire country," Additional Director General Mritunjay Mohapatra said. 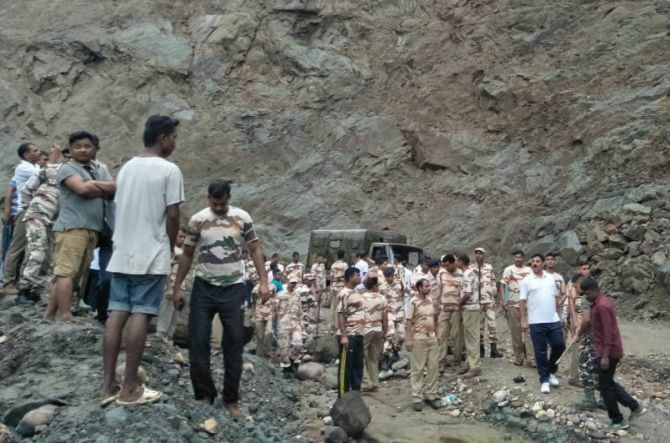 Meanwhile, in Lower Siang district of Arunachal Pradesh, four ITBP personnel were crushed to death when a huge boulder, loosened by monsoon rains, rolled down a mountain and hit their vehicle on the Basar-Akajan road on Friday, police said. The incident occurred 5 km from Likabali, the district headquarters of Lower Siang, when they were on way to it from Basar in West Siang district. The boulder rolled down the mountain slope and smashed the mini bus carrying 20 ITBP personnel. This is a second landslide-related incident in the state within five days. The toll due to landslides this monsoon has risen to nine. The Manali-Leh National Highway-3 was blocked after heavy rainfall triggered landslide in Himachal Pradesh's Kullu district on Friday. An official said efforts are underway to clear the road. Landslide reportedly occurred due to heavy rains in Marhi last night. However, the district administration came to know about it in the morning when some tourists informed them about the road blockage. In Jammu, the night temperature dipped further as monsoon rains lashed parts of the state for a third consecutive day on Friday, according to the weatherman. The city had a high of 28°C, 9.7 notches below the season's average, the MeT office spokesman said. The weatherman said the Batote area along the Jammu-Srinagar national highway gauged 132.4 mm of rainfall during the past 33 hours, ending 5.30 pm on Friday. Landslide blocked Jammu-Srinagar national highway late this afternoon, leaving hundreds of vehicles including those carrying Amarnath pilgrims to the base camps in the Valley stranded, a police official said. Heavy rains triggered the fresh landslide at Gangroo near Ramsu along the 260-km long highway -- the only all weather road connecting Kashmir with rest of the country, and efforts are on to made it traffic worthy, Deputy Superintendent of Police Vishal Manhas told PTI. Nearly 1,300 pilgrims paid obeisance at the holy cave shrine of Amarnath in south Kashmir Himalayas on Friday, an official said. However, the pilgrimage had to be suspended from both Pahalgam and Baltal routes due to incessant rainfall in the valley. Meanwhile, the flood situation worsened in one of the six affected districts of Assam on Friday, as one more life was lost taking the death toll to 32. State Disaster Management Authority (ASDMA) said. The death toll has risen to 32, it said. A population of 67,976 are currently affected by the flood in six districts with Charaideo having the largest affected population of 35,429.